“New Programmes for Skopje Old Bazaar” was the title of the first workshop organized by Skopje Urban Living Lab with students of the Faculty of Architecture, University “Ss. Cyril and Methodius” in synergy with the city of Skopje as partners within the ROCK project actions in Skopje. The workshop took place in February and was organized around four main themes: 1. Transformation of Public / Semi-public Spaces; 2. Transformation of Parking Lots; 3. New Green Areas; 4. Accessibility and Movement Improvement. The main goal of the workshop was to assess and explore the potential embedded within the area of Skopje Old Bazaar through designing of different scenarios for the spatial and programmatic transformation of the area. Project designs developed by students have been focused on the transformation of the public space through the design of a permanent/temporary layout for the public or semi-public space. Another group of students has been working on the transformation of the parking lot into a community-led urban public space/ various events and performances and pro-active design of temporary co-shared parking lots. The third group of projects has addressed the idea of the development of new green spaces design and landscaping from a temporary installation to a permanent garden. Finally, one of the main goals of the ROCK project interventions has been attained by a group of students working on accessibility and movement improvement through the possibility of removal of existing barriers. The group also performed mapping and analysis the accessibility throughout the historic district. Accessibility has been seen as a physical, cultural and relational aspect or as an element of inclusiveness and security. 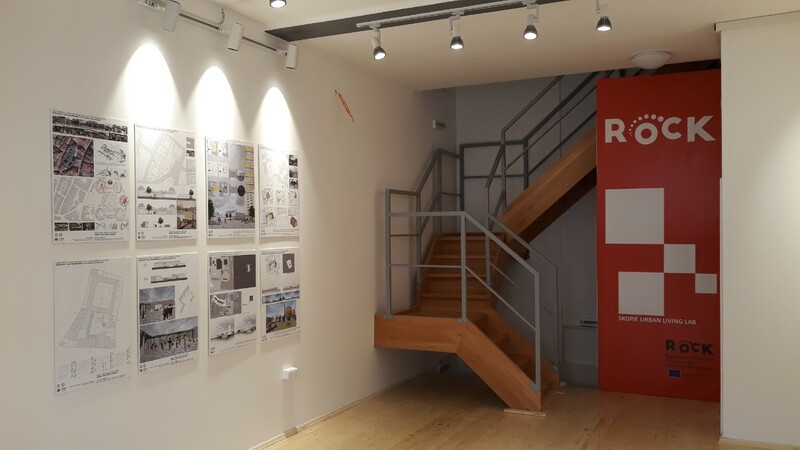 The opening of the exhibition of the projects developed during the workshop is on 1 April 2019 at the Skopje Urban Living Lab premises in Skopje Old Bazaar. The workshop was held at the Faculty of Architecture, University “Ss. Cyril and Methodius” in Skopje from 4-10 February 2019 under the guidance of Prof. Vlatko Korobar, Prof. Jasmina Siljanoska and Associate Prof. Marija Mano.